Ok it’s confession time. I have an addiction, and I think it’s time to share it. I’m hoping I’m not alone in this. Here goes …. I am badly addicted to plain, white v-neck tees. Like, hopelessly. As I was writing this post up, I realized my last outfit post also had a white v-neck. It’s my Spring/Summer staple. I love that it can me styled in SO many different ways, as is evident from my last post, and this one. I must have, at least, 10 of em in my closet. When I find a good one, I buy em in bulk. Not joking. I wear em with jeans and skirts, and under blazers, and under cardigans, and with flats, and with heels, and tucked in, and with a dainty necklace, and with a statement necklace, and with sweats, and like a million different ways. I’m addicted, and I won’t stop. I can go on and on about how to dress up a basic tee, too. Let me count the ways ….! 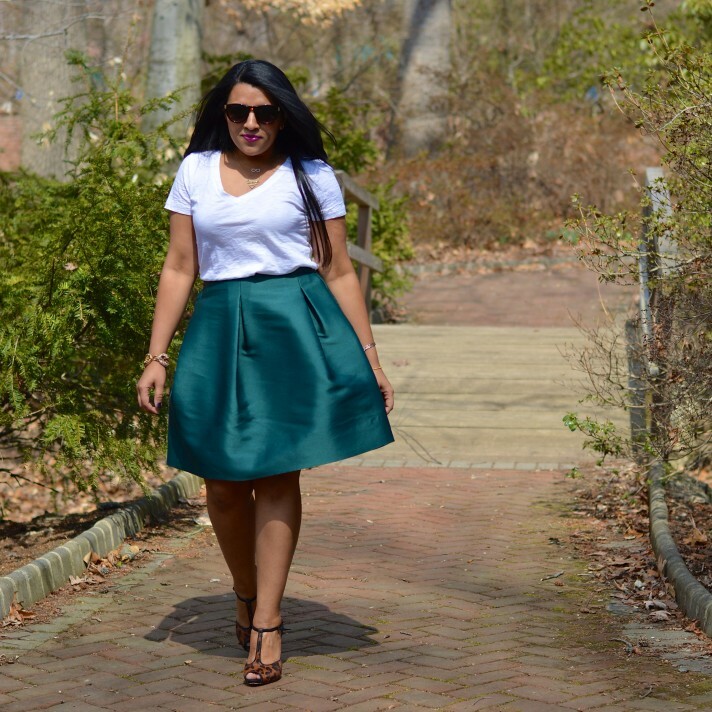 By the way, remember this skirt from this holiday outfit post? By the way, you guys might remember this outfit from this Instagram post! I love this triangle necklace I recently scored – it’s the perfect mix of edgy and dainty! So, do you guys have any addictions like that? Any items you’re hooked on? 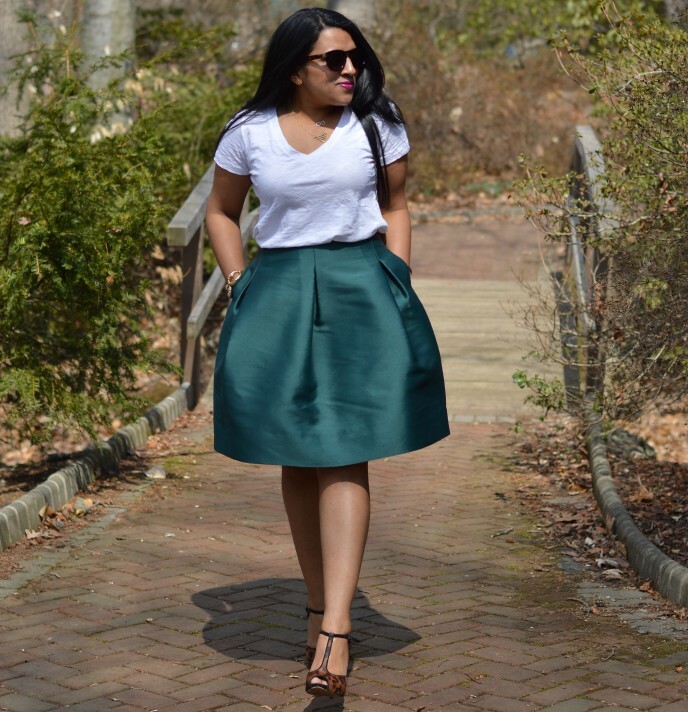 My tip on how to dress up a basic tee – add a statement piece – heels, accessories, or a statement skirt. I also love pairing it with faux leather pants and a blazer! 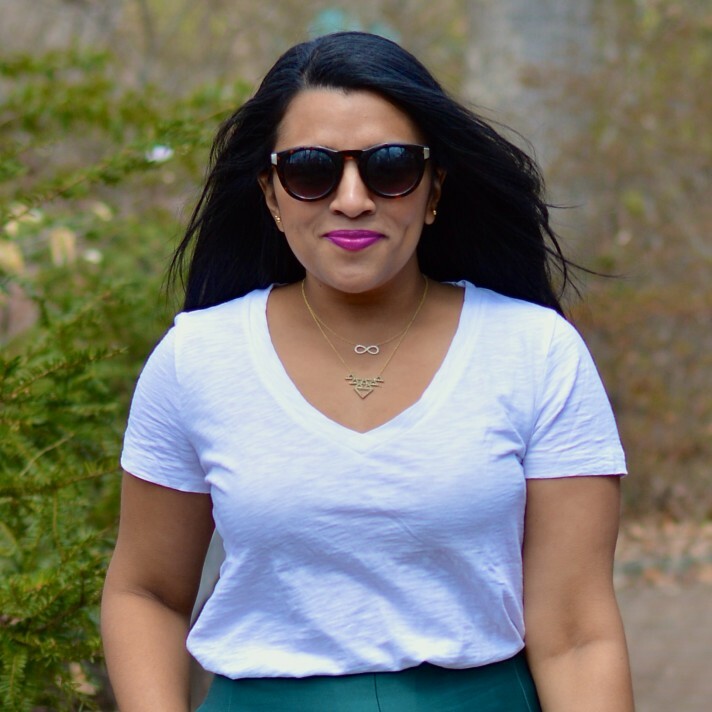 What are some of your no-fail tips on how to dress up a basic tee? I’d love to hear your ideas!